There is NO "D" in LIQUI-FIRE. "D" stands for "D"angerous, and "D"estructive products sold by "D"eceptive marketers! Click here to Securely Order Now. "LIQUI-FIRE" is available to ALL stores and consumers in North America without an account. We use the most trusted and secure online banking system and never see your credit information. Prepaid online cost is $17.99 per bottle and can be made using any major credit card. Purchase orders cost per bottle is $18.99 and can be faxed to (905) 373-0735. ALL orders are shipped FREE in North America with a suggested retail cost of $24.99. Stores everywhere have customers asking for "Liqui-Fire" by name. Give your customers what they are willing to buy. Consumers; write this number down (905) 373-0237 and tell the store YOU are their customer and YOU want and need "LIQUI-FIRE”. Consumers who cannot find Liqui-Fire at a store in your area can buy as little as 2 bottles from Woodsmans International. Simply click the "V" on the right side of the buy now button. A drop down menu appears allowing you that option. Click here to read the truth on heat tape. You'll be amazed. Being a smart shopper you will save time and money shopping where Liqui-Fire is available. Listen to Radio stations anywhere in Canada or the USA. Any time you hear "Get Lucky With LIQUI-FIRE", be the first listener to call in and you'll receive a free bottle of LIQUI-FIRE. So come on Everyone, "Get Lucky With LIQUI-FIRE" The fastest and safest way to thaw any frozen pipe. Many Villages, Towns, and City's Works Departments like and use "LIQUI-FIRE"
"LIQUI-FIRE" is the ultimate in power and performance. Nothing else comes close! Re-orders with endorsements attached are common. Seeing is believing, or in this case hearing first hand is believing. Here's another endorsement that speaks for itself. Here's a happily surprised store owner. In the beginning, "LIQUI-FIRE" was made to be the safest and strongest pipe thaw. IT STILL IS ! 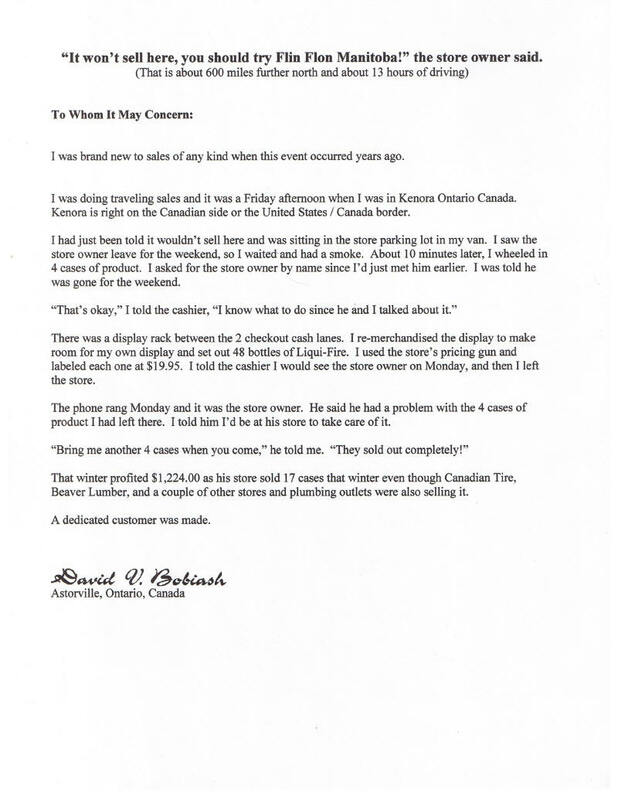 Our retail customers take time to write. Only "LIQUI-FIRE" looks like "LIQUI-FIRE" works like "LIQUI-FIRE and is "LIQUI-FIRE"
The tap means it's safe for drinking water lines. A side spout for easy pouring. With a water spout you'll shout, "Horray!" But a drain cleaners have labels of drain traps. Dear Sir, I would like to tell you that your "LIQUI-FIRE" Pipe Thaw is an excellent product. We have sold many cases of it and had nothing but great feedback. Please send me another case of "LIQUI-FIRE" Pipe Thaw when you receive this. This was another very happy retail store & a customer that sent an endorsement with his faxed order. This was written by the newest employee who was hired as part of my campaign challenge to other employers to hire (if they can). She was here when a customer called who had been carrying buckets of water from the creek on his property for over 6 weeks. I put his call on speaker phone so everyone could hear it first hand as to how happy this man and his wife were. They both carried buckets of water for 6 weeks! Wow! It's always nice when a new employee hears a customer call. It gives them a good feeling to know people are truly happy with the product. I like seeing the office staff high-five each other in happiness every time another happy customer calls to thank us. Thousands of customers are made happy every year. ... and being in an area where temperatures reach minus forty degrees celcius in the winter, we certainly put it to the test. We found "LIQUI-FIRE" Pipe Thaw to be an asset to our line of stock items, and will continue to support this product: as long as it is available. In one winter season, this store profit on "LIQUI-FIRE" Pipe Thaw was $1,224.00. The store owner was certain it wouldn't sell in his area. Many other store including Beaver Lumber, Husky Gas Bar & Resturant, a plumbing wholesale store, and a few other locations were also selling "LIQUI-FIRE" Pipe Thaw in his area. Liqui-Fire (without a "d") is safe for wells, water intake lines, drinking water pipes in the walls under a mobile home or in the ground. Liqui-Fire thaws any frozen pipe including frozen drains, sewage lines, septic lines and pipes and sewers. Liqui-Fire is also good for thawing frozen sump pump discharge lines. LIQUI-FIRE has all the power and stature of a Harley Davidson Motorcycle. Anything else is like a moped by comparison. NOTHING measures up to "LIQUI-FIRE". And best of all Great consumer demand and satisfaction. Copyright © 1993 - 15 Aug 2018 Woodsmans International All rights reserved.